This enigmatic artist is called the great mystifier, and his personality is associated with secrets, rumors, and speculations. People all over the globe are attracted by his street art. 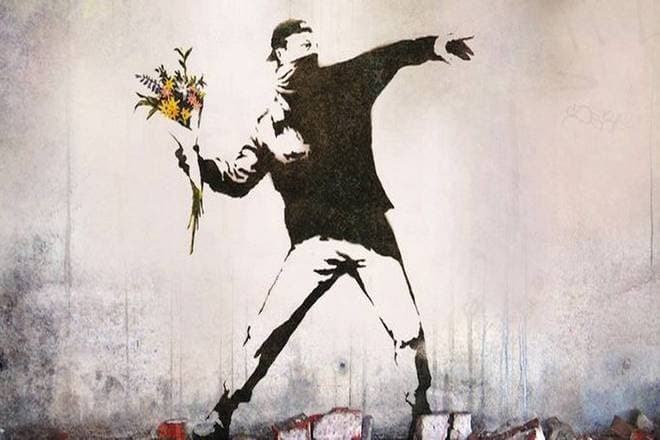 Banksy is the artistic breakthrough who has proved it is possible to create anonymously. He is the first artist whose graffiti works are discussed in terms of the modern art. 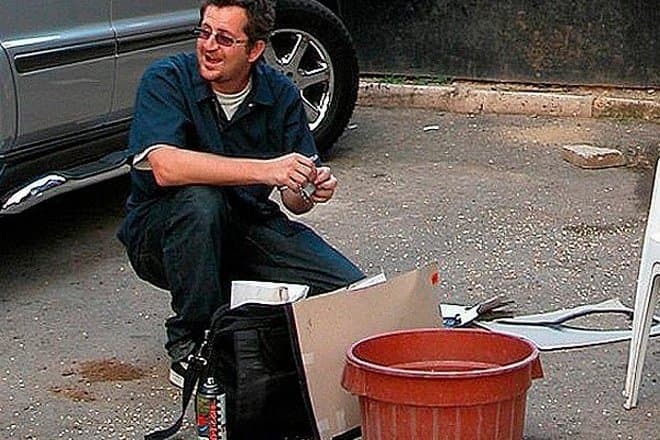 No art critic knows for sure who stands behind Banksy’s artistic figure. There are three more or less credible theories. According to the first assumption, Robert Banks is the real name of the graffiti artist. The second suggestion is based on a broad investigation conducted by the Queen Mary University of London scientists. They claim Robert or Robin Gunningham, known as Banksy, was born in Bristol in 1974. The rebel’s interest in graffiti and character manifested themselves in the late 1990s when his works proved to be technically good and showed the deep meaning of significant social phenomena for the whole society and individuals. Naturally, the authorities did not like that. Running from the police became a normal part of the street artist’s life. 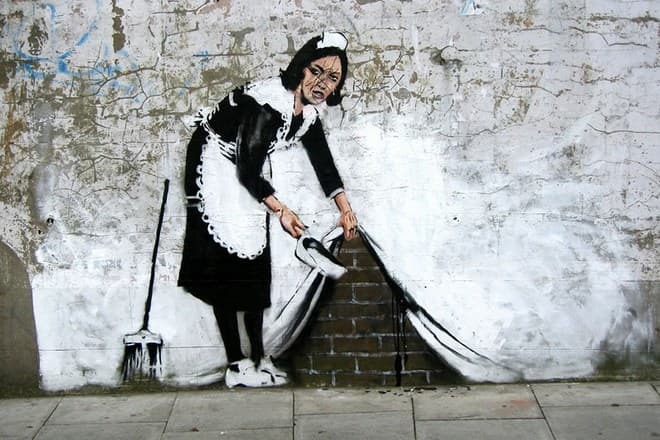 In this respect, Banksy invented his stencil style; it became his trademark. Stencils gave the opportunity to act momentarily: as soon as the artist could hear the police siren nearby, he could hide in the nearest corner and pocked his spray paint. The more the graffiti master was chased, the more burning and relevant works he created. People noticed his ironic and philosophical sketches and took pictures of them. Soon, other European cities started talking about Banksy; in a while, his fame came across the ocean. 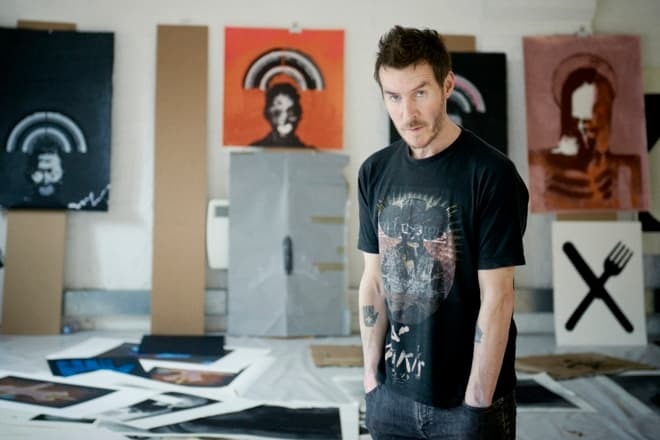 The third version has been suggested by the British journalist Craig Williams: Banksy is Robert Del Naja, the soloist of the trip-hop group Massive Attack. 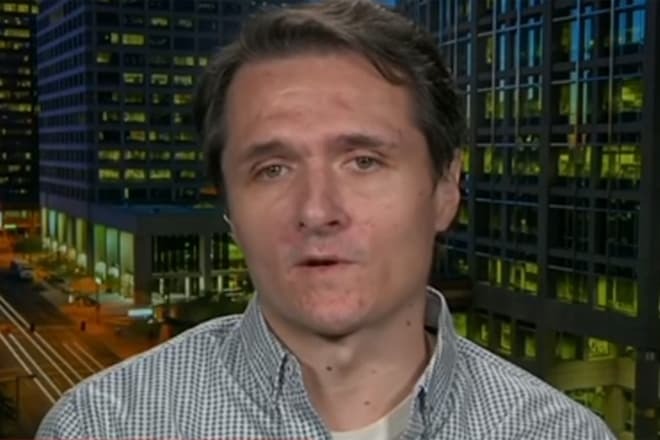 The journalist made sure his guess was right when he discovered that Banksy’s works appeared in the same places the group gave concerts. Overall, there were ten matches throughout 12 years. Besides, Del Naja is also fond of graffiti: he has been creating them since the 1980s. The musician says he has nothing to do with Banksy. Williams also admits that several artists may be working under the name of Banksy: the enormous amount of work gives some ground to believe that. Banksy has created numerous works. The artist’s unique “comments” on social events and public attitudes turn out to be headline-making. 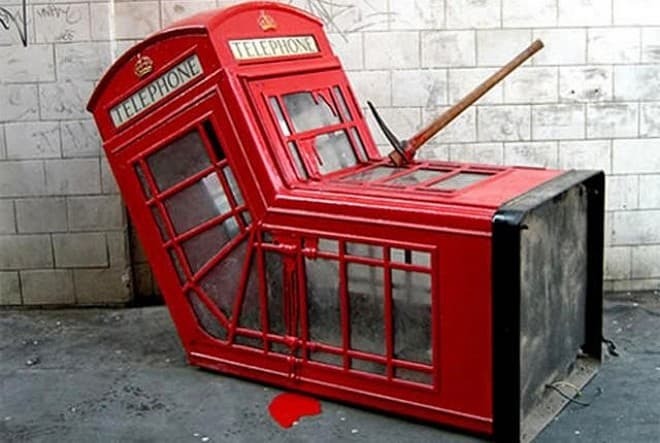 In 2006, Banksy presented the installation in Soho, London: the axed red booth. The audience’s interpretation varied: some people accused the artist of attempting on the city classic symbol while others admired the elegant nostalgia for the epoch of face-to-face communication. To criticize the absorbing epoch of consumerism, Banksy portrays crucified Christ with shopping bags and a crying girl who is led by two symbols of America: Mickey Mouse and Ronald McDonald. Banksy often applies to social morals. These ideas are illustrated in Kissing Policemen (2004) and Naked Man (2006). The former masterpiece was presented in Brighton, London, not far from Trafalgar Square. In 2014, it was auctioned for $575 000 in Miami. 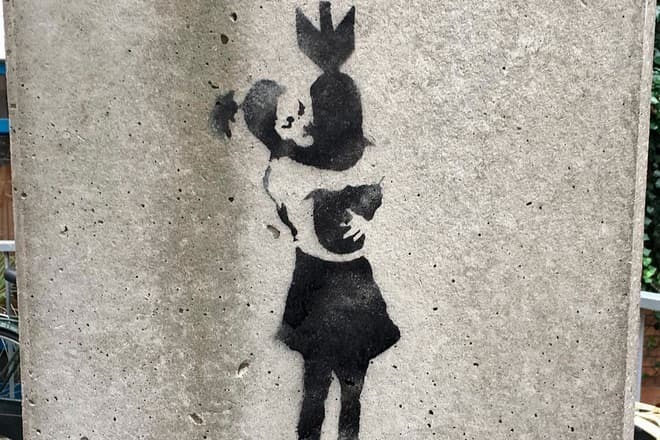 Just like at the beginning of his career, Banksy devotes many of his works to peace issues: he criticizes military operations and political provocation. 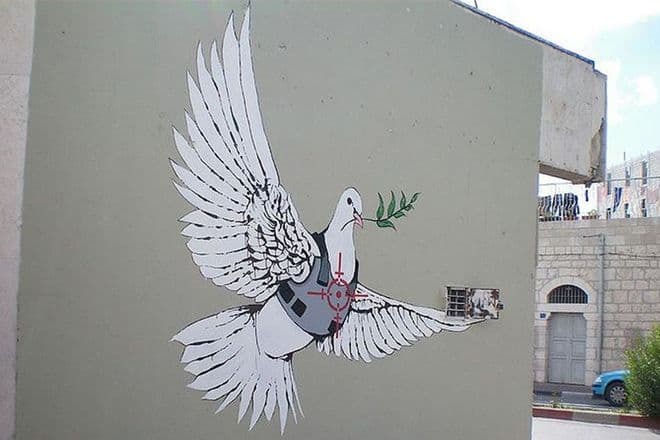 There are many fascinating examples: Rage, Flower Thrower (Jerusalem, 2003) that pictures a rebel who throws a bouquet instead of a petrol bomb; Armored Dove (2007); Bomb Hugger (2003). The graffiti art peak pertains to the early 2000s. At this period, Banksy’s works were acknowledged. The yesterday’s hooligan and vandal, the artist turned into a social pop-art genius. Celebrities and collectors were purchasing his masterpieces gladly, and people were ready to give considerable money for his works at auctions. For instance, in 2008, his Maid Sweeping Under The Carpet created together with the British artist Damien Hirst was sold in New York for the recording $1 870 000. In 2010, Banksy presented his documentary Exit Through the Gift Shop at the Berlin International Film Festival. The main character, the director who was running a project about graffiti art, talks to graffiti artists. Banksy himself appears in the movie with his face hidden in the hood shadow. In 2015, the artist felt like going beyond the limits of the existing forms and initiated the exhibition to parody Disneyland. 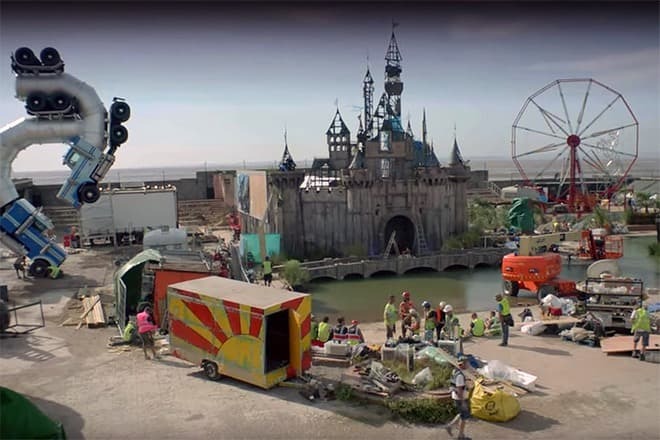 The exposition “Dismaland” took place in the resort town Weston-super-Mare. Indeed, the exhibition created the depressing image: ruins of gothic castles changed splendid palaces, fairy-tale carriages were bowled over, and swimming pools were full of swamp mud. Among the recent works, the 2017 graffiti where a worker is erasing a star from the European Union flag stands out. By this illustration, the creator expressed his opinion on the Brexit. The artist’s controversial personality and the aura of secret only ignite people’s interest in his works. Today, one can see them in the Lilley Fine Art Gallery (Ireland), modern art museums, and private art collections all over the world. The artist’s works are also presented on his official website. The attempts to identify the great mystifier are being made. In 2017, the fake news on Banksy’s identity was spreading on the Internet: allegedly, 35-year-old Paul Horner from Liverpool was the artist; he was arrested at an exhibition in Palestine. Reputable media ignored this news; Banksy’s disclosure is still to come.